Wing span: 2 1/4 - 3 inches (5.7 - 7.6 cm). Identification: Forewing hooked; upperside is red-orange with black spots. Upperside hindwing of summer form is mostly black with a short tail; that of winter form has much orange and a longer, violet-tipped tail. 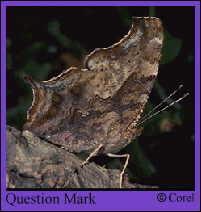 Underside is light brown; hindwing with pearly white question mark in center. Life history: Males find females by perching on leaves or tree trunks in the afternoon, flying to chase other insects and even birds. Females lay eggs singly or stacked under leaves of plants that are usually not the hosts. Caterpillars must find a host plant; they then eat leaves and live alone. Adults of the winter form hibernate; some staying in the north, many migrating to the south. Flight: Overwintered adults fly and lay eggs in the spring until the end of May. The summer form emerges and flies from May-September, laying eggs that develop into the winter form; these adults appear in late August and spend the winter in various shelters. Caterpillar hosts: American elm (Ulmus americanus), red elm (Ulmus rubra), hackberry (Celtis), Japanese hop (Humulus japonicus), nettles (Urtica), and false nettle (Boehmeria cylindrica). Adult food: Rotting fruit, tree sap, dung, carrion. Only when these are unavailable do Question Marks visit flowers such as common milkweed, aster, and sweet pepperbush. Habitat: Wooded areas with some open space, city parks, suburbs, fencerows. Range: Southern Canada and all of the eastern United States except peninsular Florida, west to the eastern edge of the Rocky Mountains, south to southern Arizona and Mexico.